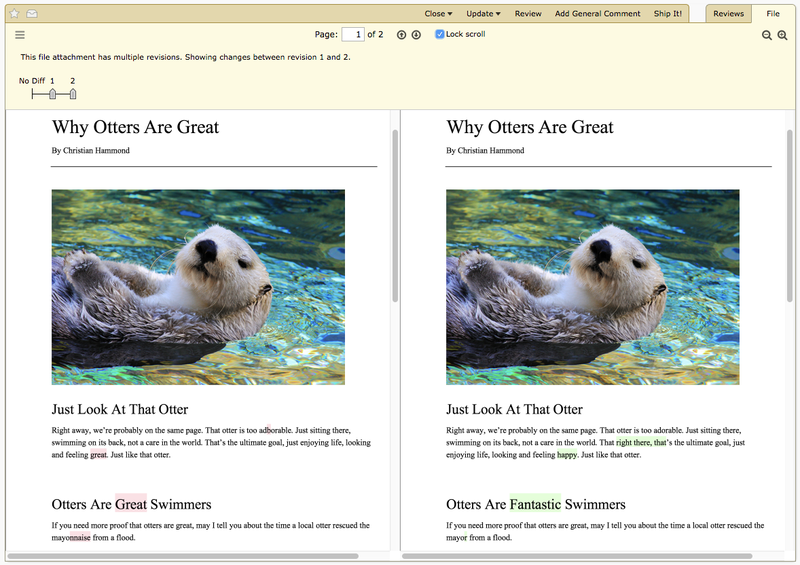 The new major release of Power Pack 3.0 brings the ability to diff PDF documents, comparing how the text of the document changes between revisions, and makes it easier to manage your license subscriptions. This can drastically cut down on the time needed to read through documents as the author takes in suggested edits from reviewers. Just like a code diff, any text changes made in a document are shown inline in the PDF, color-coded for easier viewing. A handy new sidebar view catalogues all the changes made throughout the document, so there’s no need to carefully scrutinize as you scroll. If you do need to scroll, a new “Lock scroll” checkbox gives you control over whether the documents should scroll in sync, or scroll individually. In order to enable diffing support for PDFs, you will need a PDF document that contains text information embedded in the document (such as when printing to PDF or using OCR on a scanned document). It’s also important to update the existing PDF file attachment with the new document, instead of creating a brand new upload. We’ve revamped the Power Pack configuration page to better show the status and health of your license, how quickly the expiration date is coming up or whether you’re hitting your user cap. The new “Manage your license” button takes you straight to our license portal where you can renew your license, convert to a yearly subscription, add additional users, and more. Power Pack now checks for updates to your license automatically when viewing the Power Pack configuration page, and will install any new license it finds. You no longer need to download and install new license files from the license portal yourself. We’ve sorted out some crashes and visual glitches in reports, as well as a compatibility problem with AWS CodeCommit. The full list of changes are in the release notes. Get started today with a 30 day trial license. After 30 days, enjoy a complimentary license for up to 2 users forever, or purchase a license for the rest of your organization.